From diamonds to dog food to Dom Pérignon Champagne, Costco is known as an astute marketer of high and low. 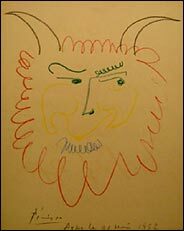 Recently, it even ventured into the rarefied world of Picasso, selling a crayon drawing at its Web site for a bargain $39,999.99. The buyer, Louis Knickerbocker, a meat distributor from Newport Beach, Calif., had never fancied himself a big-league collector. But as he was cruising to work in his sport utility vehicle one day, a radio news report about the Costco offering roused him to action. Mr. Knickerbocker, 39, quickly called his wife, Diana, on his cellphone and asked her to race to the Web site and charge the purchase to his American Express card. “Worst-case scenario, we can always return it,” he recalls telling his wife. Actually, the worst-case scenario may be that the drawing is not a Picasso — an assertion that has Costco scrambling to live up to its consumer-friendly image. The work, “Drawing Arles,” depicting a faun, came ready-to-hang in a gold frame; the store even provided a photographic certificate of authenticity signed by Picasso’s daughter Maya Widmaier-Picasso, who also authenticates his works for auction houses like Sotheby’s and Christie’s. But as Mr. Knickerbocker discovered this week, navigating Costco’s fine-art offerings can be a tricky business. Interviewed in Paris by The New York Times on Tuesday, Ms. Widmaier-Picasso, 70, said the certificate was forged. As of Tuesday, a Picasso drawing titled “Picador in a Bullfight” was being offered at Costco’s Web site for a much steeper $145,999.99 — also with an authentication certificate bearing Ms. Widmaier-Picasso’s name. Bristling at a grammatical error in French and the spiky handwriting, she pronounced that document a forgery as well. The artist’s daughter, 70, also cast doubt on the authenticity of the drawings. “My father knew that bulls have two testicles, in addition to something very masculine,” she said impishly, referring to the bull. Contacted about Ms. Widmaier-Picasso’s remarks, Liz Elsner, a vice president for merchandising for Costco’s Web site division, said the company would promptly investigate. “Obviously we’re very concerned with what you’re telling us,” she said. She emphasized that, as with all Costco merchandise, Mr. Knickerbocker was free to return the artwork. A few hours later, the bullfight drawing had been removed from Costco’s Web site. Ms. Elsner said the two Picassos were provided by reputable dealers with whom Costco has done business since it entered the fine-art market. The vendor is Jim Tutwiler of Boca Raton, Fla., who bought them from Rick Yamet, a fine-art vendor in Peekskill, N.Y.
Told of Ms. Widmaier-Picasso’s contention, Mr. Tutwiler said, “Are you serious?” and quickly provided Mr. Yamet’s telephone number. When buying Picassos accompanied by his daughter’s certificate, he said, he routinely has Ms. Widmaier-Picasso examine the certificate, he said. He said he had faxed the certificates for both Picassos to her, but this time she had not responded. “I was getting no response for months and months. It became like an exercise in futility,” Mr. Yamet said. So an associate of his in Rome showed the drawings and certificates unofficially to an expert at Christie’s in Paris, who gave them a verbal nod, he said. Costco, which entered the fine-art market in 2003, sells artworks both through its Web site and at scattered road shows around the country, many of them conducted by Mr. Tutwiler. The shows are handled by two separate corporate divisions, and the vendors and artworks are always changing. Although most of the headlines have been generated by last year’s Picasso sale, Costco’s current fine-art offerings seem to boil down to lithographs. In print circles, that can mean anything from an offset reproduction of a painting — in other words, a poster — to the sort of genuine “original print” that an established dealer might handle; that is, a work of art conceived as a lithograph from the start and produced in a limited edition. At press time, there was nothing of that nature on Costco’s site. Of course, neophyte collectors — the type that Costco is likely to attract — may often lack experience in determining what gives an artwork market value. While Costco provides a phone number at its Web site for the vendor of each work of art so that prospective buyers can question the consigners directly, it is hard for an inexperienced collector to seek out those specific earmarks — a good provenance, inclusion in a catalogue raisonné, for example. For the art world cognoscenti, the authentication affair may seem a tempest in a teapot, given the abundance of scrawled Picasso doodles, real and fake, to be found in galleries on every continent. And art scholars have long debated whether Ms. Widmaier-Picasso should be in the business of authentication. Still, in reviewing the certificates in her apartment on the Quai Voltaire, she was emphatic about their falsity. She described the wording on the bullfight certificate, for instance, as strangely unfamiliar. On the back of the certificate, Ms. Widmaier-Picasso applies a sticker marked with one or more of her fingerprints. “I could also use my entire hand if I wanted to,” she said. She then applies an embossed seal over the sticker and staples the sticker to the photograph. She said she always keeps a record of which finger she used for each authentication. But for Costco and its customer, who is much attached to his $40,000 doodle, it is no laughing matter. Mr. Knickerbocker expressed skepticism about Ms. Widmaier-Picasso’s reaction to the drawings and the certificates. Mr. Knickerbocker, who once bought his wife a two-carat diamond ring at Costco, said he remains a loyal customer and that for now he has no plans to return the drawing. “I think a lot of times with this, especially with art — high-end, number one — I’m sure that the art galleries hate that Costco’s selling art,” he reflected. Thanks for the article. It however contains a number of inaccuracies. Notably, 40K for this uninspiring Picasso drawing, even if it were real, is no bargain. Many authentic Picasso drawings can be had today for less than half that price. They may be worth their cost, but they are not great works. A good Picasso drawing at current prices sells in the six and seven figures, and rarely even in the low eight figures. Second, the drawing is an obvious fake, copied after a very similar drawing dating from the same day, as depicted in the appropriate catalogue raisonné. I don’t believe that a Christie’s expert would have given the alleged “verbal nod” without first looking the piece up in this catalogue, after which it would have been obvious that the piece is a fake. Even before comparing it to the catalogue photo, there are enough sloppy mistakes in the fake to make one doubt its authenticity.